The contributions of Lottery operators in Nigeria to increasing the opportunities of its citizens in seeking for alternative ways of earning legitimate income came when Luck finally shone on Mr. Andrew Fabian, an Abuja-based local washman as he won the sum of Twenty five million, one hundred and Ninety-nine thousand, twenty naira and sixty kobo (N25,199,020,60) courtesy of the coupon of Winners Golden Bet-GWB on Sunday 24th of March, 2019. “On this particular day when the game remained one, I was on my kneels as the last bet on straight win was losing 1-0, but as God would want it, the team leading were issued a red card in the 70th minute, this made the game I bet on for straight win equalized and scored in the dying minutes of the second half. The victory for the team turned out to millions of Naira for me can’t you see that this is my year of success? I have been looking for how God will help turn my business of local washman around. I have been operating on manual washing method for a very long time, but with this jackpot, I will buy state of the art washing machines to help boost my business. 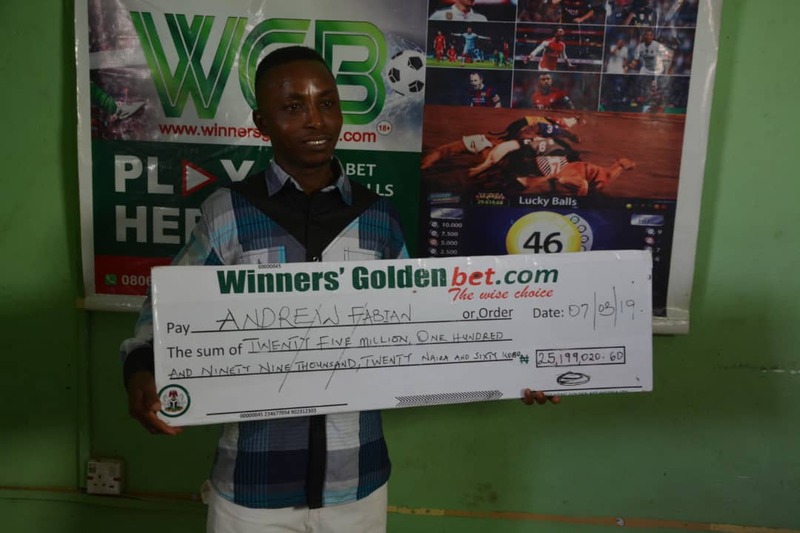 I’m so grateful to God for answering my prayer and I’m so grateful to the management of Winners Golden Bet for paying my winning immediately,” Fabian said. The revelation came like a surprise to many who have not been patronizing Winners Golden Bet to now have a change of heart and seeing the sincerity of the operating outfit to have paid its winner Mr. Andrew Fabian without rancor are trooping in to try their luck. This is one of the ways Winners Golden Bet has added value to Nigeria’s economy be engaging in transparent multi-income generation for the vulnerable and low income earners including middle level income earners too.